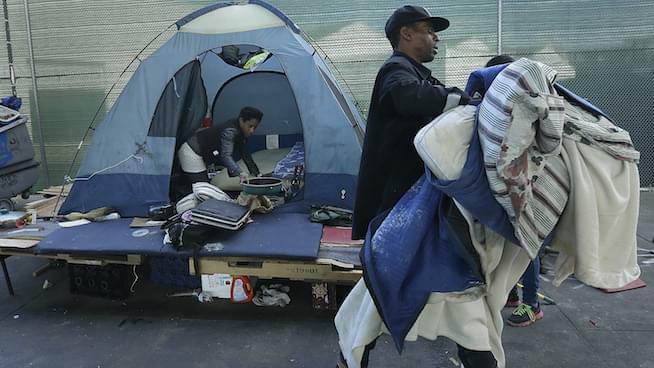 California officials will have an additional component to consider when it comes to formulating a strategy to address the exploding homeless crisis following a ruling by the Ninth U.S. Circuit Court of Appeals in San Francisco Tuesday that deemed it unconstitutional for cities to penalize people sleeping on a public street or sidewalk when shelters are not available. KRON 4 reports the ruling could bring forth legal action against the city of San Francisco as well, where it is currently a misdemeanor to sit or lie down on a public sidewalk, or on a mattress or other object on the sidewalk, between 7:00 a.m. and 11:00 p.m. Host Chip Franklin agrees with the verdict on paper; however, when he looks around at his surroundings he sees the other side of the coin. He revealed just this week he witnessed three homeless people sleeping in a San Francisco park meant for children complete with a needle on the ground in the area. Medoro looked at the situation through a more positive lens. She is hopeful some out-of-the box thinking will eventually unearth a fix, although she admitted it’s unclear just what that would be with so many moving parts to take into account — particularly mental illness. In the podcast below, she and Franklin discuss the biggest challenges that they see when it comes to getting to the bottom of the homeless issue and imagine what they would do if they themselves were put into circumstances that led them with no other option than living on the streets.